After the incarnation, the cross of Jesus is the greatest proof of His love for man. 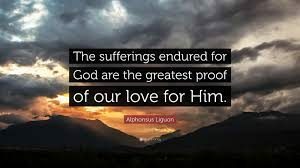 Similarly, mortification, which is suffering eagerly excepted for the love of God, is one of the greatest proofs of love that we can give Him. It means freely giving up a satisfaction or pleasure in order to impose on ourselves for love of God, something which is contrary to our own natural inclinations. We thus prove that we prefer to satisfy God rather than ourselves. Every act of voluntary mortification, whether physical or moral, says to God, “Lord I love you more than myself!” And since a soul in love has an ardent desire to give proof of its love, it is very vigilant not to miss a single opportunity for renunciation.